As I drove up El Dorado Street from Downtown Stockton during a recent evening, I noticed a man in a wheelchair waiting to cross the street under the glare of my headlights as I drove past, unimpeded by any stop signs or traffic lights. I looked around wondering, where would he cross as there were no crosswalk in sight. But I continued on, assuming that he found a way to safely cross the busy three-lane street in the dark. But later that evening, I started to think back to the man in the wheelchair. Why does he have to cross the street illegally? 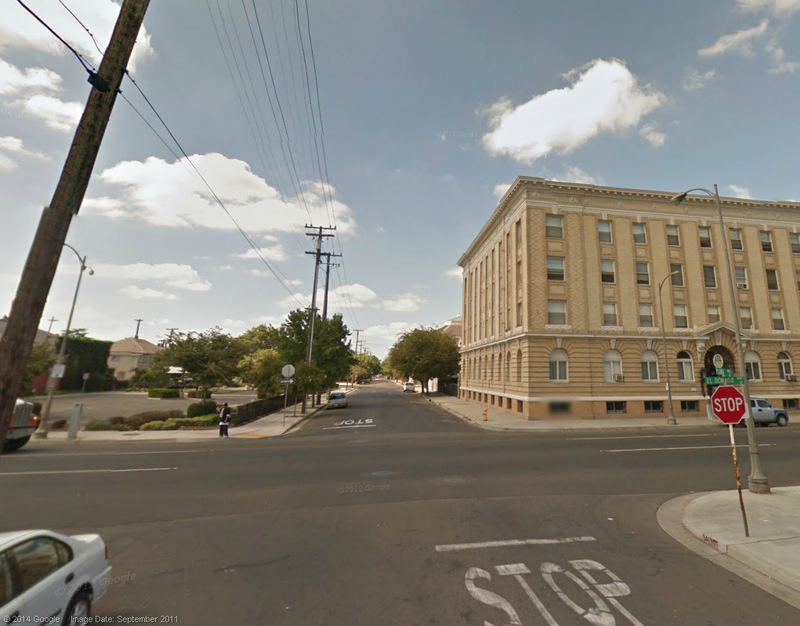 Why are there so many intersections with no crosswalks in Stockton? The answer to these questions essentially boil down to this: for decades, traffic engineers have been taught to prioritize moving cars quickly at the expense of pedestrian safety. The intersection at El Dorado and Flora Streets does not have crosswalks, forcing pedestrians to choose between crossing the street illegally or venture several blocks in either direction to find a crosswalk. As it turns out, there was a time when all traffic engineers considered crosswalks to be dangerous for pedestrians. A former city traffic engineer once explained to me that Stockton’s crosswalks created a “false sense of security” for pedestrians. As a result, several of these “uncontrolled” crosswalks — defined as marked crosswalks where no traffic controls, such as a stop sign or signal, exist — were removed many years ago, leaving us with the less-walkable streets we know today. That same traffic engineer explained that crosswalk removal aided in efficiently moving traffic through arterial streets, a key component of a traffic engineer’s job description in the 1970s, when the systematic removal of marked crosswalks from uncontrolled locations began. This curious logic was based on a single study from 1972, referred to as the “Herms Study,” after traffic engineer, Bruce Herms. Herms found more pedestrians were struck at uncontrolled intersections where a crosswalk was marked than in those left unmarked, concluding that pedestrians experienced a “false sense of security” within marked crosswalks. On the basis of this “theory,” engineers have been removing marked crosswalks for decades while failing to provide alternative solutions for pedestrians. But despite their influence, Herm’s methods were questionable as he did not account for other causes of pedestrian-vehicle conflicts at those intersections, and his sample size was small – using only a handful of crosswalks in San Diego. Nevertheless, the country’s crosswalk policies have been shaped by this flawed study for nearly forty years. In Stockton, a lack of crosswalks is the norm, with four arterial streets carrying vehicle traffic in and out of downtown standing out in particular: West Park and West Oak Streets, between North Pershing Avenue and downtown, and North Center and North El Dorado Streets between downtown and West Harding Way. Not surprisingly, three of these four street segments make the city’s 2035 General Plan “Top 20” list for either bicycle or pedestrian accident locations. Without crosswalks, pedestrians are more likely to dart out illegally to cross a street, putting themselves and drivers at risk. While traffic engineers may be appropriately cautious about placing crosswalks in uncontrolled locations, especially on multi-lane arterials, they have erred too far in the other direction by completely removing crosswalks, pronouncing pedestrians safer as a result. “Road diet” guru and walkability expert Dan Burden notes that pedestrians are more likely to cross mid-block illegally when controlled intersections are more than 300 feet apart. On Park and Oak Streets, there are no crosswalks for nearly a mile stretch, or 5,000 feet. With two one-way lanes in either direction, neither Park or Oak Street is listed as a key arterial in the city’s General Plan. Center and El Dorado Streets, however, are listed as key arterial streets in the General Plan, with daily traffic volumes hovering around 20,000 on each street. With three one-way lanes each, there are no crosswalks for the five blocks between Acacia Street and Harding Way, a distance of about 1,700 feet. North of Harding Way, there are no crosswalks on Center Street for six blocks (where Center Street dead ends at East Cleveland Street). On El Dorado Street north of Harding Way, there are no crosswalks for nearly an entire mile. So what can be done to repair the mistakes of the past? Thankfully, more recent studies have debunked Herms’ “false sense of security” theory. In 1999, the Federal Highway Administration (FHA) found that pedestrians exhibit more, not less, caution while crossing in marked crosswalks, while drivers actually slowed down slightly when approaching marked crosswalks. While caution should be used in locating crosswalks in uncontrolled intersections, the study indicates that crosswalk markings, appropriate signage, and other safety measures aimed at warning motorists should not be avoided on the theory that they induce a “false sense of security” in pedestrians. In 2001, the FHA confirmed these earlier conclusions with a more in-depth follow-up study (referred to as the Zegeer Study). As a result, federal guidelines were revised to indicate that a marked crosswalk is considered safe for a 2-lane roadway if the speed limit does not exceed 40 miles per hour and traffic volumes fall below 12,000 daily vehicle trips. This seems to fit into the existing conditions on both Park and Oak Streets. As Stockton grows, it is clear that we need to protect the walkable qualities of our existing traditional neighborhoods by facilitating safer pedestrian connections. It’s time to abandon the argument that crosswalks make streets dangerous, and begin the thoughtful installation of marked crosswalks and other pedestrian enhancements on Park, Oak, El Dorado and Center Streets. The man in the wheelchair will surely appreciate it. Near the George W. Bush school on Fred Russo, we have a similar problem. There is no official crosswalk, or even two crosswalks for students to cross the street going to and from the school. Instead, there are kids running across the street wherever they desire. It is very, very dangerous. And I am puzzled why the leaders/parents at the school have not pushed for a crosswalk, when they said they would four-years-ago. I was just told by a City of Stockton representative that they have been working with school districts on making walking and bike riding to school more safe with Safe Schools Funding.